On the eve of Fall Weiss (Case White) and the subsequent campaign (Kampania wrzesniowa in Polish), the Polish forces had 1012 tanks and a hundred armored cars (880 tanks according to other sources) at their disposal. 220 of these were modern light 7TPs (of Polish design), Renault R35s (French) and Vickers Mark Es (British). There were also 792 older models, mostly tankettes (690) and 90 antiquated French FTs, dating back to 1919-22. They were facing the Wehrmacht’s 2400 tanks and, above all, a new tactic combining breakthrough concentration, rapid advance and envelopment under constant, real-time air support. The most common Polish tankettes were no match for Panzer III and IV. However, it appeared that, on some occurrences, some Polish units obtained great successes, notably using ambush tactics and specially equipped tanks. The 7TP used a high velocity gun better than the Panzer III’s “door knocker” and it was lethal at short range. The twenty modified TKS tankettes equipped with the Nkm wz.38 FK 20 mm cannon also obtained good results. Late prototypes could have made a difference if the attack would had been a delayed by about five months. The bulk of the Polish armored forces were local-built tankettes derived from the Vickers Carden-Lloyd classic design. Two series were built between 1933-36, the TK3 and TKS. The TK3s were all armed with one Hotchkiss machine-gun and operated with armored cars, mostly on border patrols. However, in 1937-38 several variants were derived, like the TKS. This version was the most proficient of these conversions, and some vehicles were armed with a 20 mm (0.79 in) Solothurn AT rifle. They were able to pierce through any German tank and their low silhouette and good speed made them difficult to spot. But as successful as this series was, the conversion program came too late and only a handful were ready for action in September 1939. The TKW was a turret version, equipped with a heavy Vickers liquid-cooled machine-gun similar to those used by the British Mk.IVs. But only six were converted before the whole project was cancelled in favor of the 7TP. 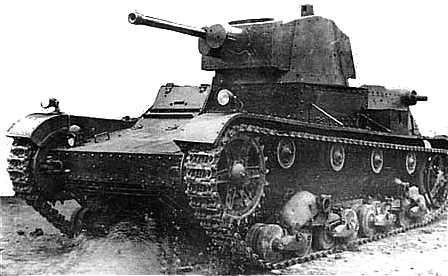 A very late version was built and was probably put in the fight in a hurry, the 20 mm (0.79 in) armed turret version or TKW-2. Several TKDs equipped with a 47 mm (1.85 in) gun were also tested, and are rumored to have been operational at the time of the invasion. Suitable for patrols on regular and average roads, armored cars were used by the Polish cavalry. The earliest models, still in use in 1939, were the eighteen Peugeot AC 18CV. Six were equipped with Puteaux 37 mm (1.46 in) guns and the remainder with a wz.25, a Polish licence-built Hotchkiss machine-guns. Obsolete by 1928, they were transferred to police units, especially those posted in upper Silesia, and fought the “Freikorps”, trained by SS officers to seize vital assets behind the lines. 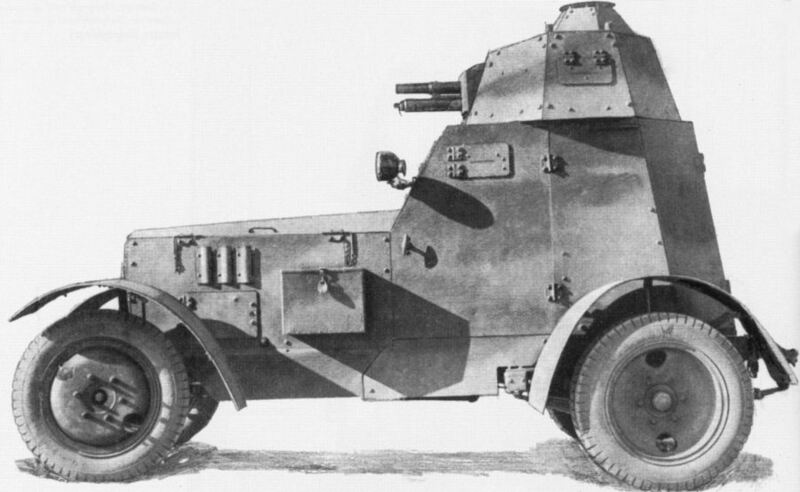 In 1939, the main force of armored cars comprised wz.34 models, former Kégresse-Citroen type half-tracks. These were AMC M23 ordered in France and modified locally, as the wz.28 by CWS (Centralne Warsztaty Samochodowe – Central Car Workshops). But these 90 cars, of which 30 were gun-armed, gave no satisfaction with their track system and were modified into the four wheeled wz.34. By 1939, they were also seen as obsolete, but nevertheless fought in small units attached to armored battalions. Most were destroyed in combat. There were also twelve heavy armored cars of the Ursus wz.29 type, armed with one Puteaux 37 mm (1.46 in) gun and two machine-guns. But against the quick moves of the German tanks and their anti-tank armament, they could do little. Less numerous than the tankettes, but much more potent, were French, British and locally built models. The oldest were the 102 Renault FTs, plus some TSF versions (radio) which had already fought during the war of 1920. By 1939, they were hopelessly outclassed, despite 65 of them being reequipped with small-link tracks in 1926. 25 more were built, without armor, by CWS in 1926, for training purposes, as were the modified M26/27s and NC27s. Many of the original FTs were equipped with a wz.25 Hotchkiss machine-gun, others with a Puteaux 37 mm (1.46 in) low-velocity gun. By 1930, the Polish army had no less than 174 of these, including radio versions. But in 1939, many were converted into armored draisines and only 90 were kept in active service, taking part in desperate defensive actions. 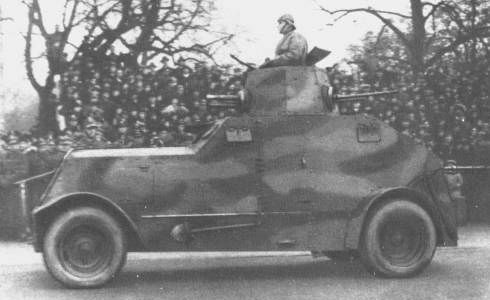 The Polish renewed their confidence in the Renault company by ordering, in 1936, a replacement for its aging fleet of FTs, choosing the well-produced Renault R35. 50 were delivered in 1939. They arrived in June-July, just in time for the first operational maneuvers. But like the French R35, they suffered many limitations. They were relatively well-protected, but were slow, their engine notably overheated and their main armament, a Puteaux 37 mm (1.46 in) short barreled, low velocity gun was only suitable against casemates and machine gun nests. They proved harmless against German tanks. 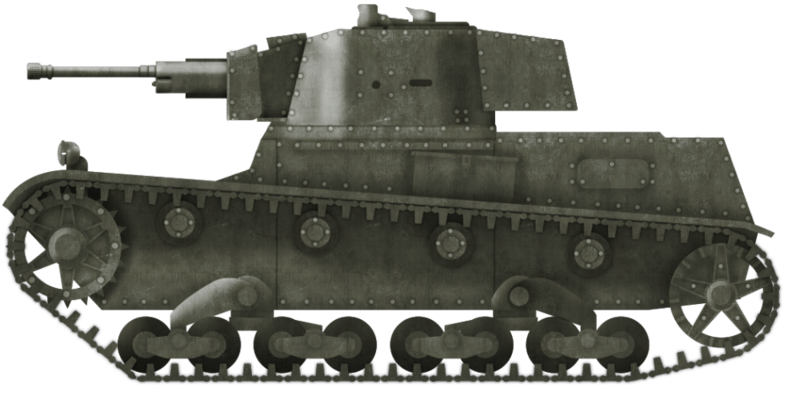 The Vickers 6-ton (Mark E) was a successful, modern Vickers design (the previous tankettes had been well-tested years earlier). 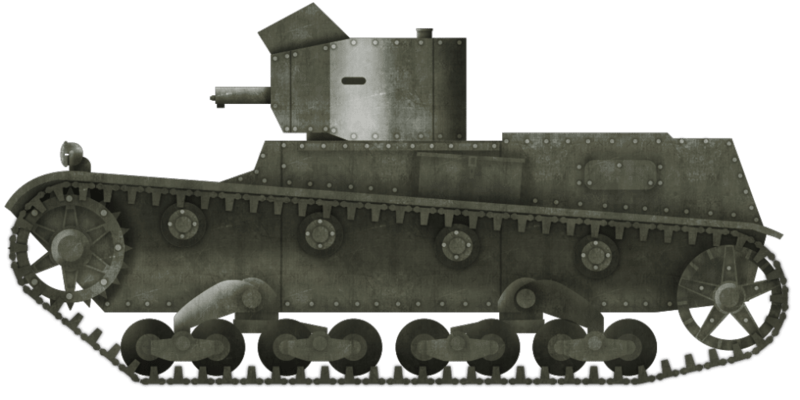 It was deemed to be relatively fast, agile and existed in two versions, one equipped with twin-turrets, both machine-gun armed (38 Type A ordered in 1931). The other version had a single two-man turret, equipped with a Vickers 47 mm (1.85 in) AT gun (22 Type B converted from Type A stocks), delivered in 1932-33 to the Polish state. The Type B, locally modified by the Ursus company, constituted the basis of a prototype which ultimately became the 7TP, a new standard tank adapted to Polish service. With spare parts and a licence already acquired, the Poles started this new development in 1936. The 7TP production started with 24 twin-turret versions and the standard one-turret version, of which 108 were produced until the war broke out. Their high-velocity 37 mm (1.46 in) AT gun, plus increased armor and a sturdy and powerful diesel engine, made it a winner. However, too few of them were available in September. Another part of the Polish defense system, due to its good railway network, were armored trains and draisines. Ten armored trains were put in action, offering good results during the later stage of the campaign, against the German rear lines. They used forested areas as cover, then struck at road intersections and various towns and villages, successfully breaking German lines of communication and supply. Each of these was typically composed of two free transport wagons, two armored wagons equipped with four machine-guns and two turrets each (37 mm/1.46 in guns), an armored Ti3 locomotive and a personal carrier wagon, also well protected. Most were captured and were used as Panzerzug by the Germans, for anti-partisan warfare and escorting regular shipping. Tatra T18 armored draisines were another kind of patrolling vehicle. Small, well-protected with 13 mm (0.51 in) sloped plates, and well-armed with a turret with machine-guns or a gun. They were operated by the Polish State Railways (PKP). 6 Tatra-built T18s were followed by 12 local-built by CWS workshops in 1927. They served during the first and second week of the German invasion. 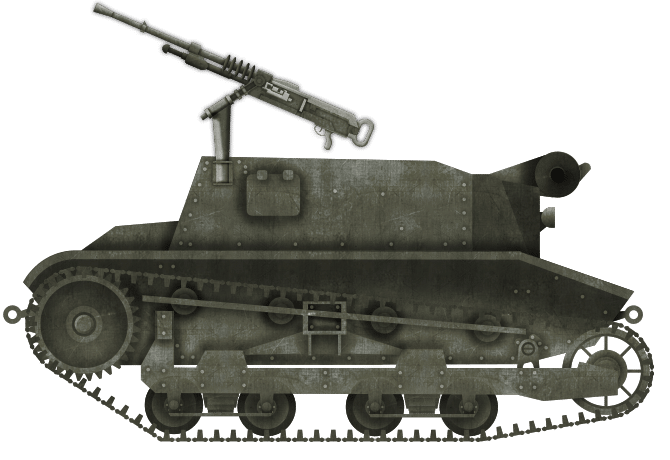 wz.34 armored car (former wz.28 half-tracks). Polish FTs participating in exercises at Biedrusk during the thirties. Polish Renault FT, one of the 90 still in active service in 1939. 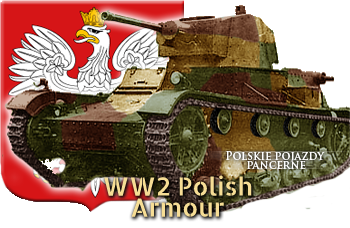 Most of the Polish tanks in service in September 1939 were TK3 and modernized TKS tankettes. Vickers Mark E dw (twin turret) armed with two Hotchkiss wz.28 machine guns. It’s painted with the 1932 four-tone so-called Japanese style camouflage. Vickers Mark E jw (single turret) armed with the 37 mm (1.46 in) low velocity gun and with a coaxial Hotchkiss machine-gun. The 7TP was a great success. It was developed from the Vickers Mark E. However, too few were built. 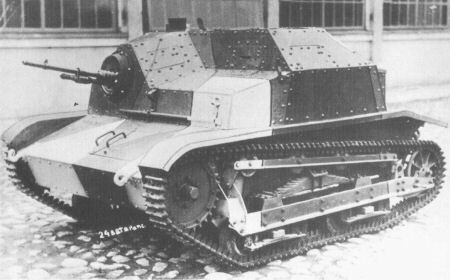 The 4TP, a 1937 prototype for a modern scout tank. 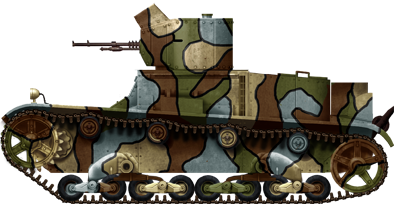 The 1937 10TP was the first Polish cruiser tank design with the Christie suspension system. 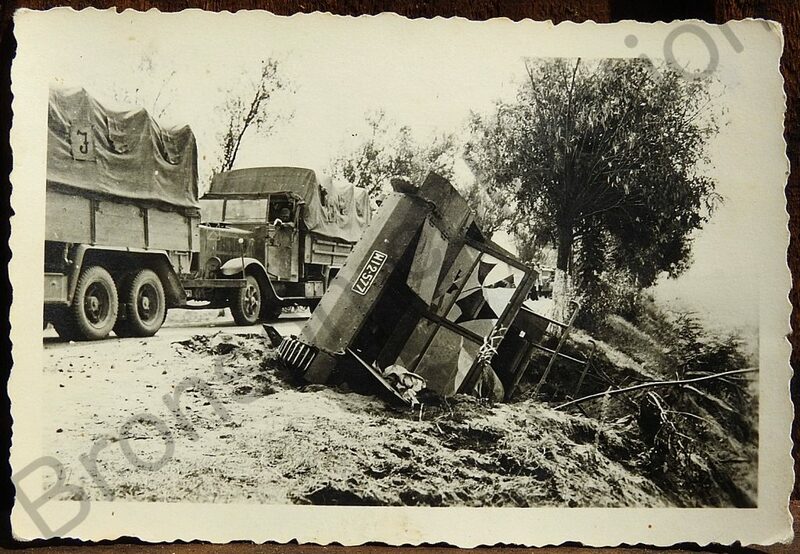 An overturned Polish C2P tracked tractor being passed by German trucks, probably during the Invasion of Poland. Source: Bronson, British Collectors of Arms & Militaria Forum. “The twenty modified TKS tankettes equipped with the Solothurn 20 mm (0.79 in) AT rifle also obtained good results.” (http://www.tanks-encyclopedia.com/ww2/polish/ww2_Polish_Tanks.php) – it was Polish design called NKM 20 mm – (Najcięższy karabin maszynowy – heaviest machine gun) – look at this, Wikipedia both Polish and English say something about our NKM – https://en.wikipedia.org/wiki/Nkm_wz.38_FK ;-). Hi Mirosław, thanks for you observation, the article has been updated ! Hi Dawid, thanks for answer – I guess it’s much better to name Nkm wz.38 FK 20 mm – heaviest machine gun not AT Rifle as is still in text 🙂 . We had great AT Rifle but it was only infantry weapon – it was called Karabin przeciwpancerny WZ.35 UR (anti-tank rifle WZ.35 UR). I guess cannon is good world for his, gun is also acceptable if I’ correct. Military concepts of Polish engineers were great during period between wars (Gundlach periscope, bomber “Łoś”, Tański cars just for example). WZ.35 UR (UR from Urugwaj – it was named so to hide this weapon from eye of German intelligence) was so secret that not many soldiers knew how to use it. Myth about Polish cavalry charges was mentioned in PRL time movie “Lotna”. Polish cavalry never charged tanks – they were elite infantry on horseback (Battle of Mokra is great example how they fought). Of course there were plenty of cavalry charges, most famous was probably Krojanty, but literally described by Italian journalist was assault of Polish cavalry to besieged Warsaw. I can try to look for materials about polish cavalry. I remember that many years ago when I was more interested in history I found on probably BBC article of Polish cavalry armed with sword and lance, wrote about it and never got answer. English world should know real true about they eastern ally. Indeed that’s not pretty. A proper ww2, coldwar and modern Polish categories are to be created. I am, not sure that comparing the TK family with Pz IIis and IVs serves any useful purpose. One could, with equal accuracy, say that a British Carrier was no match for a Tiger II :). The point is that the TKs and Carriers occupied a different tactical niche to Pz IVs and Tiger IIs. Comparison with the likes of the British Carrier, German SdKfz 13/14 and such-like seems more productive. In comparison with these, the TKs. especially those equipped with 20mm autocannons, more than hold their own. Comparisons with the newer German armoured cars are less clear. The page is much older that the date displayed and would need some rewriting, indeed tankettes can be barely compared other than other tankettes actually. But there were opponents nonetheless. I’m sure there are other ways to write this anyway.